Donate to the team behind the Minecraft documentary and you may come away with more than just a case of the warm fuzzies. 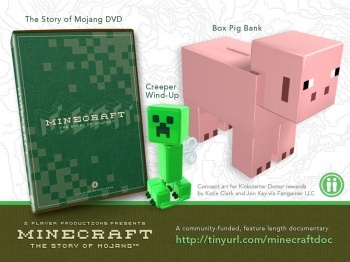 In case your deep, deep love for Minecraft wasn't quite enough to get you to donate to the production of Minecraft: The Story of Mojang, documentarians 2 Player Productions have decided to ramp up the deal by throwing in some sweet swag. Though all donations are appreciated, those who can part with at least $60 will net themselves a "Creeper" wind-up toy, his/her name in the credits, an autographed copy of the DVD and a physical copy of the documentary's soundtrack. $500 lands you a "Box Pig" piggy bank for use in saving for your next hefty donation. Generous souls donating upwards of $2,500 will snag a pick axe mounted on a custom display, signed by the crew at Mojang. 2 Player Productions has partnered with Fangamer to create all the Minecraft gear received by donors. The $350 pledge level, which allowed donors to contribute a personal 15-second video made within Minecraft to be placed within the movie's credits, has already effectively "sold out." Sorry, gang. In the few short weeks since 2 Player Productions launched its Kickstarter page, it has already passed the $150,000 goal currently sitting at a fat $166,653 without showing signs of stopping. If you would like to donate, go watch 20 minutes of Minecraft: The Story of Mojang, then proceed to pull out your all-too-heavy wallet and remedy your lack of Minecraft swag.